For this card I fussy cut one of the telephones from the patterned paper and then added rhinestonse and a little red wire for a realistic looking phone cord. This was so easy to do--I just twisted the wire quickly around the tip of my paper piercer and sandwiched a flat section on both ends behind the phone with foam tape. The "call me" and "i miss you" were spelled out using Jillibean stickers. 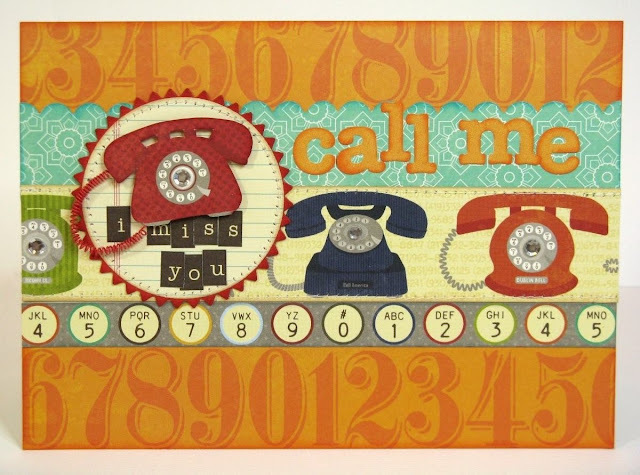 The orange numbered paper is from their sweet and sour collection, but it just worked so well with the telephone theme I thought. Cute card Mendi...and I really like how you used the orange number paper as the background...great idea! And that red twisted wire looks awesome---you are soooo creative! This is a cute card, definitely trendy! Thanks for sharing!